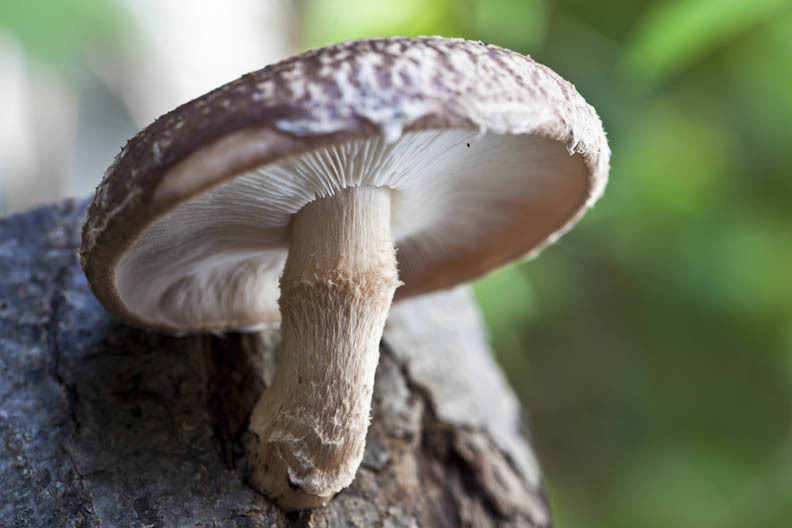 Last September, I purchased two shiitake logs to see what was involved in growing your own shitake mushrooms. The oyster mushrooms were fun to grow, but I really LOVE shiitakes and have been wanting to cultivate them for a long time. The season starts in spring, and the logs will fruit continually throughout the summer. I was lucky to get at least one harvest in before the weather turned cold. It was amazing to see how quickly they came up. Within a week, the logs were studded with tiny brown buds that opened up to these marvellous mushrooms! The logs are typically oak, and come already inoculated with the shitake spawn. The white that you see is just sytrofoam caps to prevent the spawn from drying out and also to keep out unwanted fungi. The great thing about buying these “kits”, is that it’s really idiot proof and ready to grow. 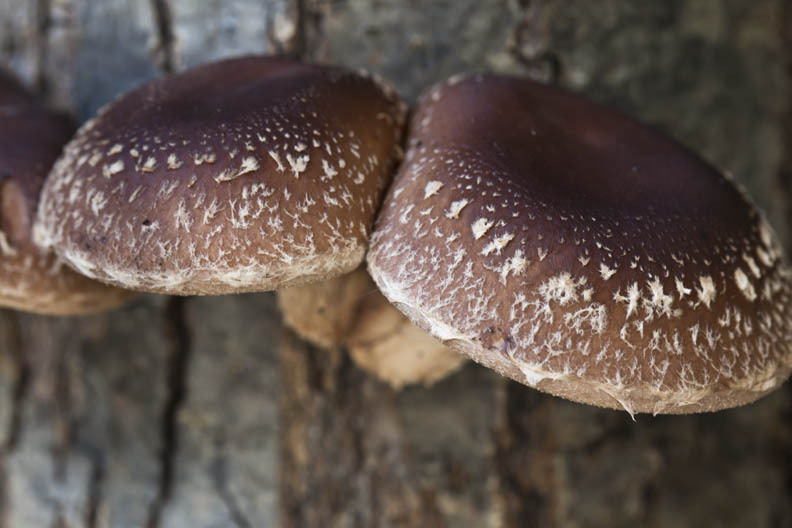 To trigger the logs into fruiting, they have to be soaked overnight in ice-cold water and then banged on its end a few times to loosen the mycelium inside. The cooler was perfect for the water bath as the lid kept the floating logs submersed, as well as keeping the water cold. Once they are done soaking, lean them up in a shady spot in your garden. 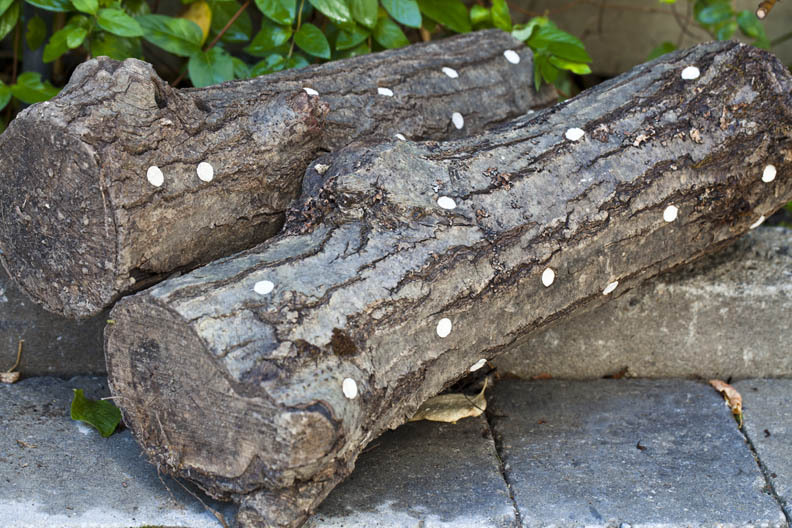 Direct contact with the soil will help keep moisture and humidity around the logs. Do not get the logs wet once the mushrooms start to appear or they will spoil very quickly. Look how gorgeous these are. Plump, and fresh and big! Not like the scrawny shrivelled up ones at the supermarket that cost you a leg. Looks like a squirrel may have been gnawing on a few of these! They are ready to pick when the gills are open and the cap is still turned under. Avoid letting the rim flare open. The whole process of inoculating your own logs is quite fascinating. We are at the cottage this week for March break, and I hope to cut a few small trees down and give it a try. The best time to cut logs is about now; once cut, you have to let them sit for at least a week. If the log is too fresh, it will attack the mycelium spawn that is introduced. A log left too long in the brush after it’s cut, becomes host to a ton of other unwanted organisms. We have a row of apple trees in the backyard that takes up a huge area where nothing edible can be grown because it is quite wet and shady. I’ve been following the principles of permaculture; working with nature and the land rather than fighting it; so it makes perfect sense to cultivate mushrooms! I will post more on that soon, but first, we (meaning Hubby) must cut down some trees!